I am never happier than when I get some seeds from a known source in the plant's native habitat and especially when it is Erythronium seed. The chance to widen the gene pool of our cultivated plants should be grabbed at every occasion. The beauty and form of seeds are often overlooked but I like to examine every part of the plants I grow, looking in detail at the structure. After detailed study it is possible to identify species from the seeds alone and you don't always need an electron microscope - digital cameras allow us to see massively enlarged images on our pc screens. These Erythronium albidum seeds came from the same generous friend and you can see that there are distinct similarities and obvious differences at the same time. 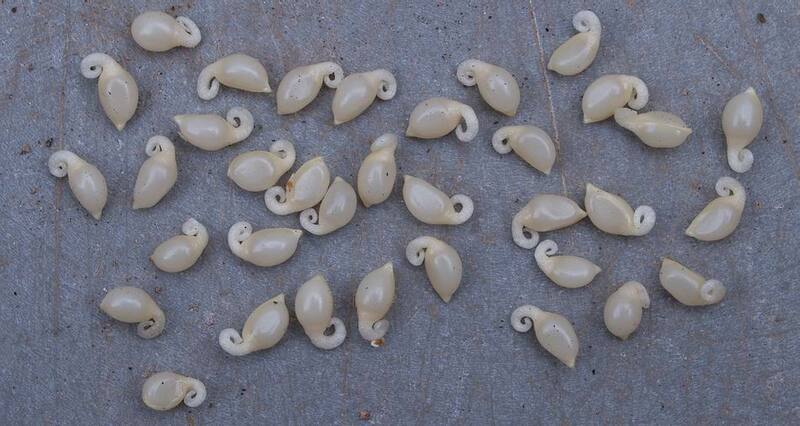 The white appendages, called eliasomes, attract ants and other insects that carry the seeds off to their underground nests; this greatly aids the dispersal of the seeds meaning they can expand territory much quicker than the mechanical catapult action of seed dispersal employed by all the Western North American Erythroniums. 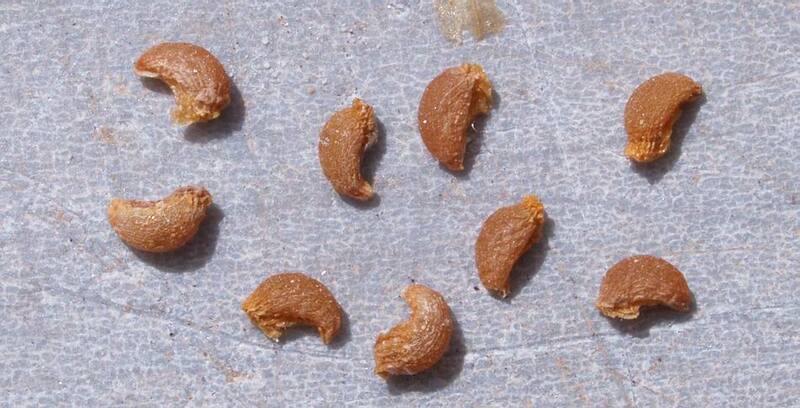 These Eastern species are much more closely related to the Eurasian dens canis complex than they are to the Western species and the presence of eliasomes on the seeds is one of the common features. As well as the delight of receiving wild seed I am also thrilled to get good seeds for the first time from our own grown Erythronium sibericum. Despite having flowered various forms of Erythronium sibericum over the years I have never had a seed set on any of them, but all those plants were acquired as bulbs : this fertile seed is the result of the first flowering of plants raised from seed. This underlines my belief that the best way to acquire and grow any plants is from seed with the obvious exceptions of named cultivars. The benefits include a better chance of having fully fertile plants with a wider gene pool and of course there is less chance of introducing plant borne diseases such as the dreaded virus. Just look at the detail of the curly attachment and also note the ridged keel and tail to this seed - fascinating. 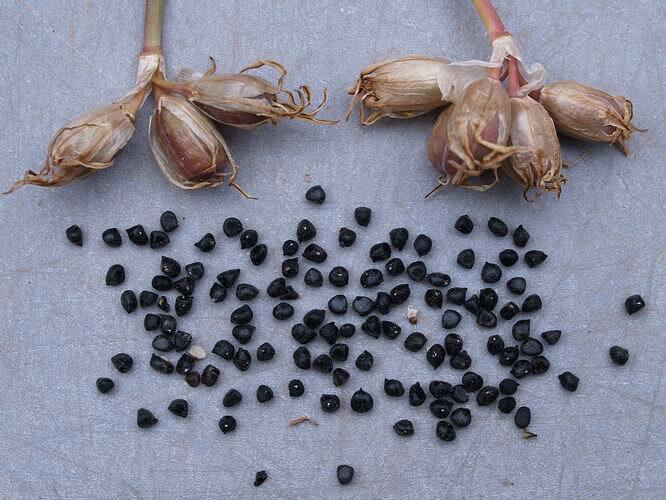 I have said that due to the bad weather at flowering times this has been a poor year for bulb seeds in our garden and this is all the Erythronium japonicum seed that I have to show. I often cover the plants when they are in flower as that increases the chance of seeds but I failed to do that this year and now I am regretting my lapse. The next decision is do I sow all these seeds now or wait until September? 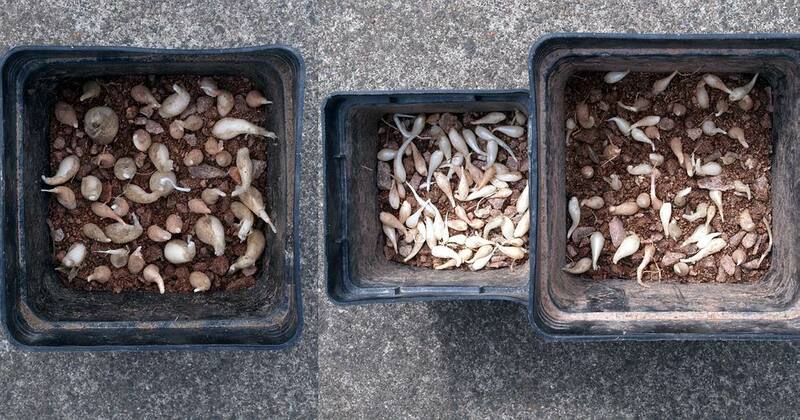 I will store these seeds in sand as described previously then I will soak them overnight in water before I sow them in September, but an alternative is to sow them now and keep the pots dry under shaded cover before watering them in September. I have lost a lot of seeds sown fresh in pots to rot during the cold damp conditions that we call summer in this part of Scotland. 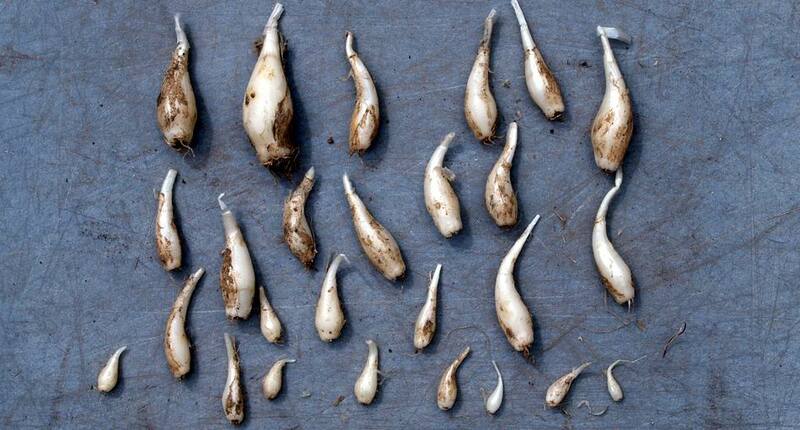 Another interesting observation is that the seeds of these Erythroniums can be sown deeply and will germinate well but the Western species do not germinate if sown deep perhaps they require light to stimulate germination. I use the way a seed is dispersed to give me clues to whether it will be best sown deeply or in the normal way on the surface with a covering of gravel. 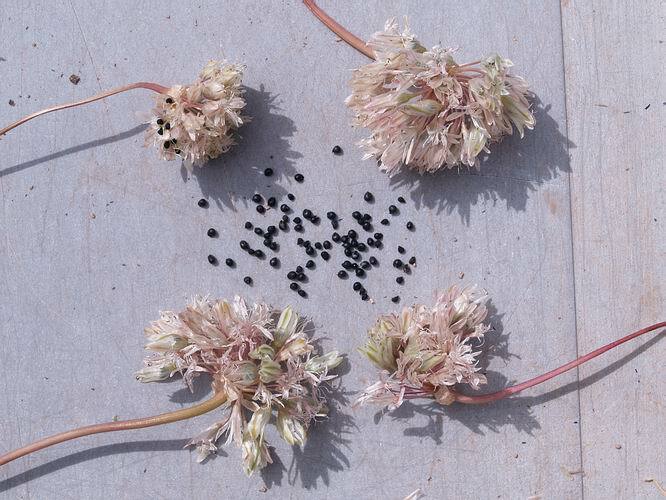 These Allium yosemitense seeds are typical of the onion family: they have evolved so the floral head dries off forming a skeletal ball which can break off the stem and tumble around in the wind, scattering seeds as it goes. This method of dispersal suggests surface sowing and my trials confirm this as I have never germinated any of the allium seeds I have sown at depth but get excellent results sowing on the surface. Again looking at the detail reveals the pinched top of the seeds and also the glorious multi coloured light that is reflected from the black surface - I hope that your computer monitor lets you see that effect on some of these seeds. 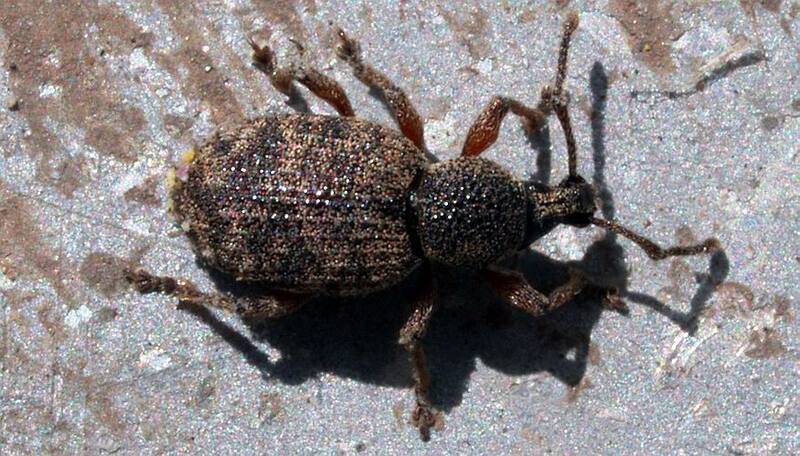 A similar colour effect is reflected from the back of this unwelcome inhabitant of our garden - Otiorhynchus sulcatus or more often called the vine weevil. 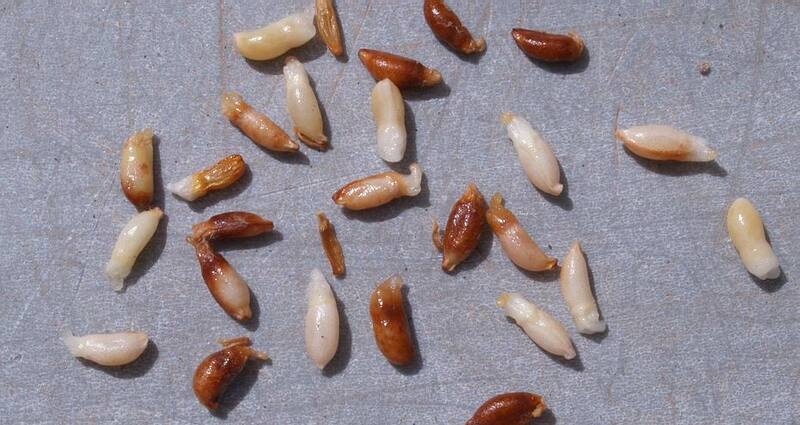 It is important to clean and also check your stored seed from time to time to make sure that nothing is eating it. Another bulb that I raised form South American seed is Tristagma leichtlinii - this seed is from the original bubs raised from that seed but I also I have several generations of seedlings which should flower next year. Here is a selection of the bulbs one two and three years old. re-orientate itself with in a season or two, depending on the type of bulb. 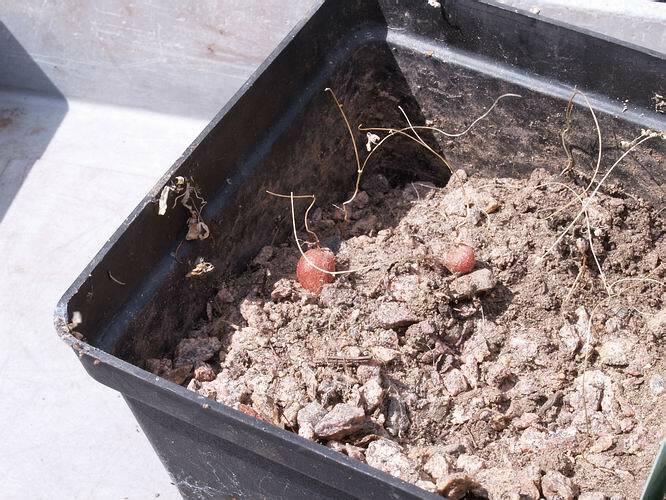 This seedling Tropaeolum azureum corm is trying to escape through the drainage hole at the bottom of the pot. It has grown half in and half out of the pot and when this happens with many other types of bulb I just snap the bulb in half knowing that at least one part will grow on.However, I am not sure how these tubers would take to being spilt so I carefully cut out a section of the pot releasing the tuber intact. I often find that if you keep them growing well in the first year of growth after germination Tropaeolum azureum often produces some small bonus tubers along the stem as well as the main tuber. 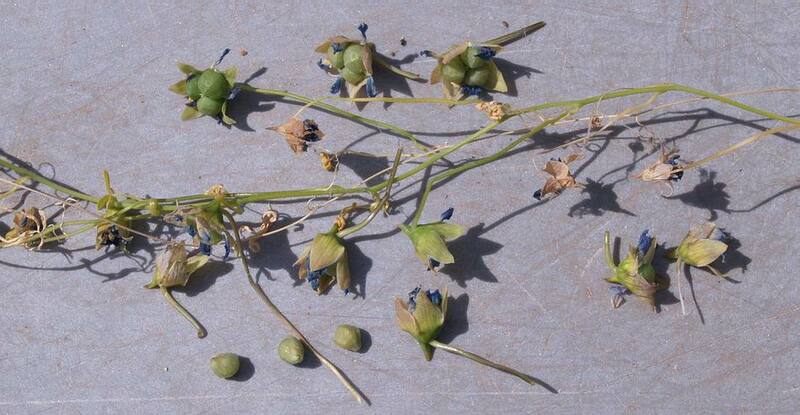 I get so frustrated with Tropaeolum azureum seeds because I cannot work out a method that gives me regular and good germination rates. Some years I get no germination at all while in others I can get a number of plants but I rarely ever get 100 percent. While repotting these new tubers I was careful to look for ungerminated seeds and I have found quite a number. I cut one open to see if it remains viable and you can clearly see that it is so they are all sown back into the pot. 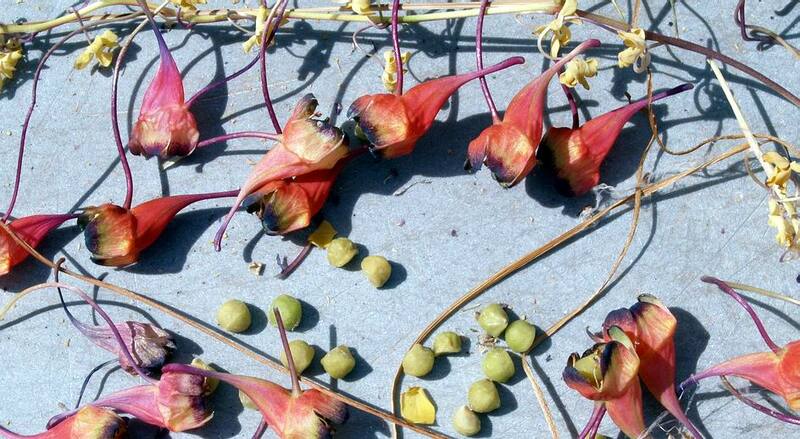 I tend to gather the seeds when they are green for a number of reasons one because they start to drop off at that stage and the second is that the remains of the flowers allows me to identify them from Tropaeolum tricolorum seeds. 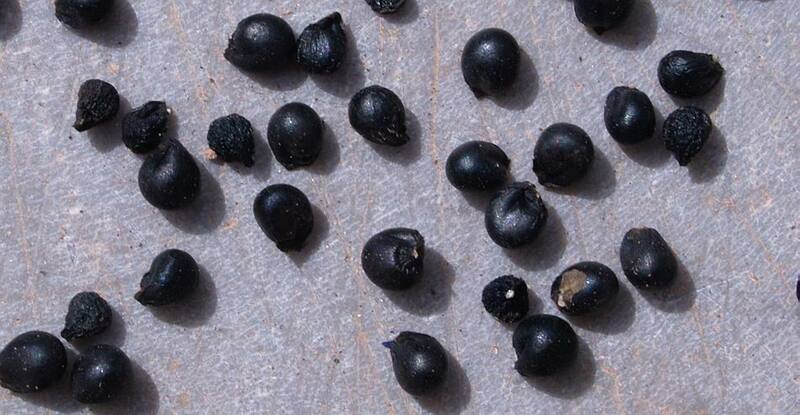 As you can see there is very little obvious difference between the seeds of these two species. 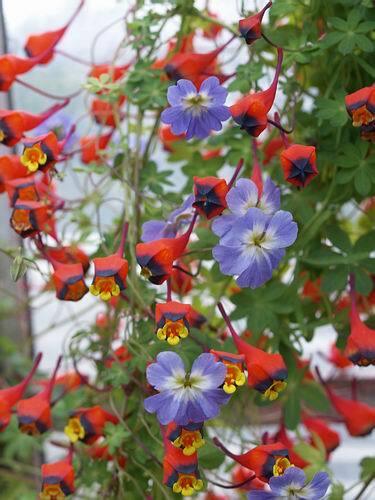 As they were growing through each other it is possible that they may have hybridised so I will have to watch out for that when the seedlings flower. Does any body know if these species cross - I am not sure what the offspring would look like it may not be pretty on the other hand it could produce a stunner - that is the fun of growing your plants from seed.